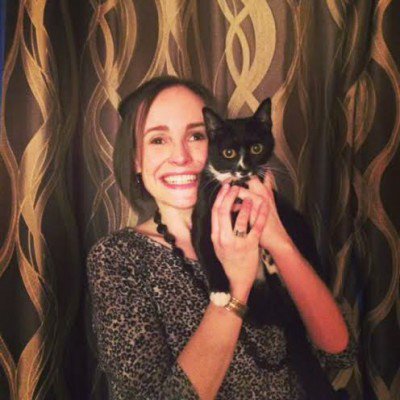 Posted in Happy Tails, Mewsletter	by Tasha B.
Amy always knew she wanted to adopt a cat but needed to wait until the time in her life was right. After buying a condo in a pet-friendly building, she came to VOKRA looking for a companion and knew she had found her match with Phoebe. Phoebe was quick to adapt to her new surroundings, exploring her territory in Amy’s condo and following Amy around to investigate every nook and cranny. Amy finds herself spending a little more time at home now since Phoebe’s such great company! Phoebe loves heights and has a favourite spot on top of the cupboards in Amy’s kitchen where she likes to keep watch. Phoebe stays mesmerized by the bathroom sink faucet, and when Amy turns it a little for her she loves to catch the water with her paw. Phoebe playing her favourite game. Would you like your VOKRA adoption story featured in our next issue? Email us with the subject “Adoption Story” at info@vokra.ca for more information. 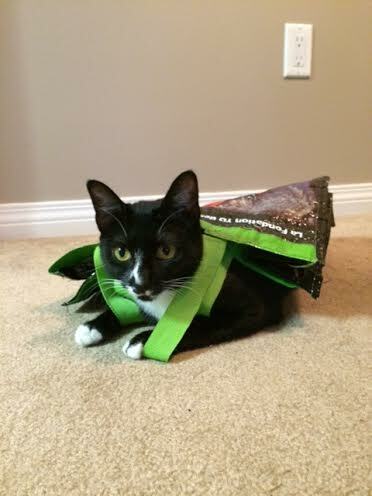 Please note that bags as shown in the picture with handles…can easily ensnare a cat. I have watched it happen seconds after a family member had just dropped the bag on the floor.The cat pounced in and started playing and the handles became wrapped around its neck and it was struggling to get free. Scary! It happened so fast but luckily we were there. I’ve seen the same thing happen when people don’t put their blind cords out of the way. Even a much older cat will go for them let alone a curious kitten. Amy ..so sorry.. I foirgot to congratulate you on Phoebe’s “happy ending”. She is such a beautiful cat. You are going to have years of enjoyment and love with that pretty girl!!!! Great point, Carolyn. Knowing Amy as I do, I know she is aware and careful with Phoebe so she is never in danger. That and that the two are inseparable! I’m so happy that these lovely ladies found each other and I look forward to watching Phoebe grow up under Amy’s wonderful care.